Among recent studies of parallel and convergent evolution, appreciation is growing for the ubiquity and importance of non-parallelism, or variation in the extent of parallelism due to differences in the direction or magnitude of divergence among ecotype pairs. In this talk, I’ll first discuss a recent review of studies of parallel evolution in fishes with the goal of determining just how parallel is parallel evolution? Next, I’ll explore two potential drivers of non-parallelism, sexual selection and evolutionary history, in two salmon species. Finally, I’ll briefly outline our NCEAS SASAP working group project on declines in salmon size and age in Alaska. Overall, I hope to highlight the variable extent of parallelism in studies of ostensibly parallel evolution and the value of investigating sources of variation among evolutionary replicates. Krista is a graduating PhD student from Andrew Hendry’s lab at McGill University, Montreal, where she studied (non)parallel evolution in fishes. Previously, she completed her honours research on hybrids between brown trout and genetically modified Atlantic salmon at Memorial University of Newfoundland, under the supervisor of Ian Fleming. 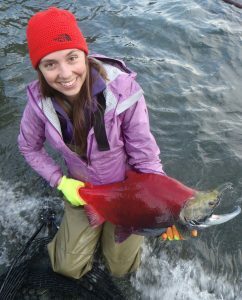 Next month, she will begin a postdoc with Eric Palkovacs at UCSC, as part of an NCEAS SASAP working group project focused on declining salmon size and age in Alaska. One of the great challenges with aquatic conservation is knowing what species are present below the water’s surface. This is particularly true for rare species such as newly arrived non-indigenous species and threatened and endangered species. A new approach to species detection, coined environmental DNA (eDNA), uses the telltale genetic signature of aquatic species in the form of tissue, cells, organelles, and DNA fragments in the water that are captured and extracted to infer presence. 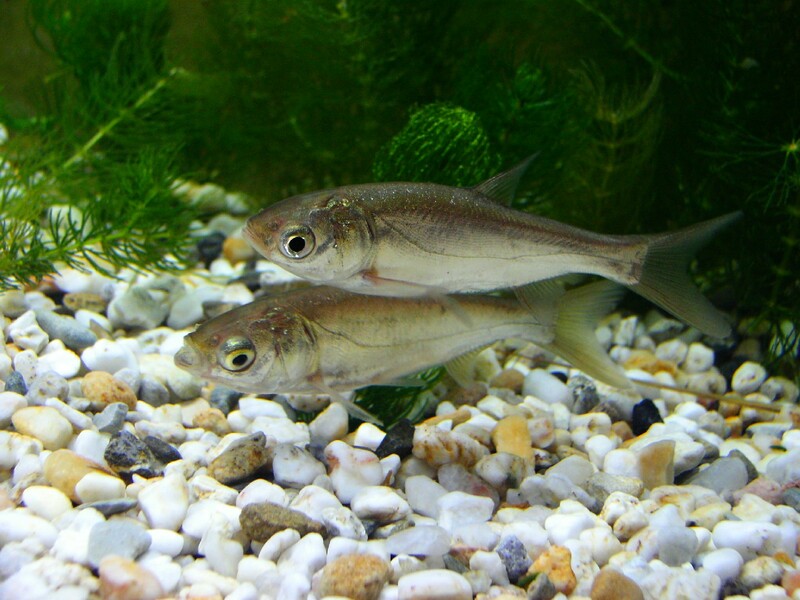 First generation applications of the eDNA methodology were applied to early detection of invasive species, but now the approach is being used to identify entire communities. In this discussion, we will explore the evolution of inferring species presence using environmental DNA, from the original detections of Bighead and Silver Carp in the Great Lakes to the attempts at estimating species richness. Throughout the development of eDNA approaches, mathematical and statistical models have motivated the sampling design and quantification of errors, and these models have ultimately driven inferences of species presence. The resulting growth in eDNA applications is leading to a new era in globally mapping the distribution and identity of species for improved aquatic conservation and management. Christopher Jerde grew up fishing and camping among the prairie pothole lakes of northeastern South Dakota. He completed his B.Sc. (2008) and M.Sc. (2002) at Montana State University surrounded by open spaces and trout. While Montana cultivated a keen interest in ecology, his experiences studying bison population dynamics motivated him to build a broader quantitative background, and he migrated north to the Centre for Mathematical Biology at the University of Alberta where he completed his Ph.D. (2008). As a postdoctoral fellow and a research assistant professor at the University of Notre Dame, Chris led the development of an environmental DNA surveillance program for invasive species, most notably searching for Bighead and Silver Carp. Now at UCSB’s Marine Science Institute, Chris’s research program emphasizes the application of novel quantitative, field, and laboratory approaches coupled with emerging technology to address pressing environmental problems.